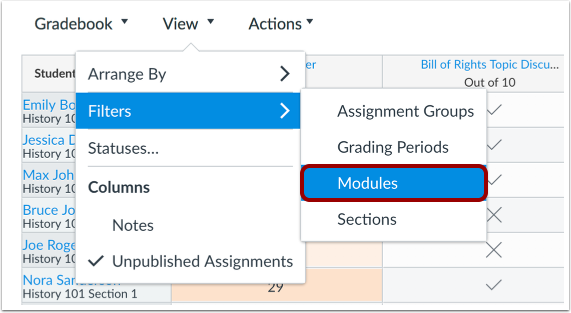 The Filter menu allows the Gradebook to be filtered by assignment group, section, modules, and grading period (if applicable). When a filter option is selected, the filter menu displays at the top of the Gradebook. Multiple filters can be used at the same time. Currently when selecting a filter, the filter retains the last viewed selection. For instance, if the Sections filter is set to a specific section and then completely removed as a filter option, the Gradebook continues to display all results from the last selected section. To ensure you can always view all items in the Gradebook, be sure to change the filter so it shows all results before removing the filtering option. The option to filter columns affects all assignments within the filter. You can also arrange columns within filter results. Click the View menu , then click the Filters link . More than one filter can be applied at any time. To filter by assignment group, click the Assignment Groups option. The Assignment Groups menu displays at the top of the Gradebook . 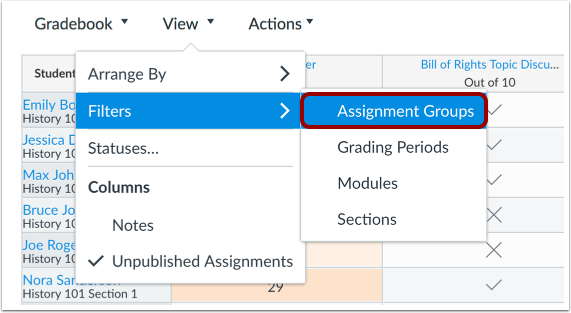 Click the menu to select the assignment group you want to view . 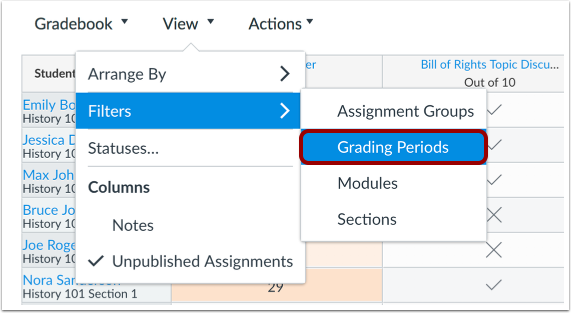 When Multiple Grading Periods are enabled in a course, you can filter the Gradebook by grading period. To filter by grading period, click the Grading Periods option. The Grading Periods menu displays at the top of the Gradebook . Click the menu to select the grading period you want to view . To filter by modules, click the Modules option. 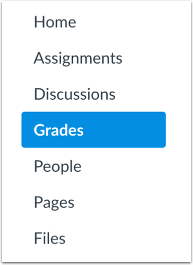 The Modules menu displays at the top of the Gradebook . Click the menu to select the module you want to view . To filter by section, click the Sections option. The Sections menu displays at the top of the Gradebook . Click the menu to select the section you want to view . 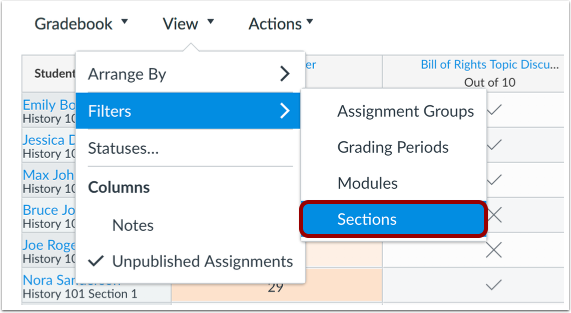 When a section filter is applied in the New Gradebook, SpeedGrader also displays assignment submissions for the same section. To remove a filter, click the View menu  and click the Filters link . Select the filter that you want to remove from the Gradebook . When a filter is removed from the Gradebook, all menu option filters are also removed . Previous Topic:How do I arrange columns in the New Gradebook? 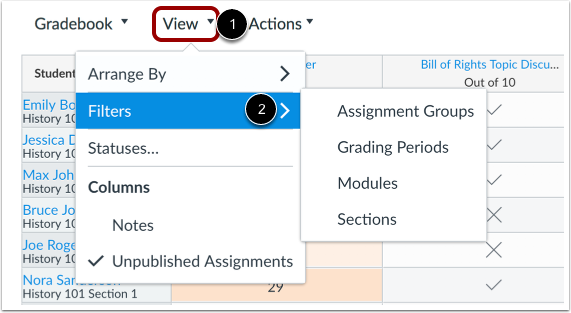 Next Topic:How do I use assignment groups and the Total column in the New Gradebook? Table of Contents > New Gradebook > How do I filter columns by type in the New Gradebook?